Your first impression might lead you to consider the Geneva Systems to be a designer statement. After all, they look fantastic in flawless gloss finishes. You might even think they look seriously expensive. So we'd better get straight to it - the Geneva Model M is both easily affordable and offers sound quality that redefines our expectations at this level. The Model M is the second model up in the line up - above the Model S. Like all the models in the range, it is first and foremost a powered speaker system to Bluetooth music to, and it is the performance that Geneva offer in this context that sets them apart from the plethora of devices from distinctly tacky to really quite good. Although the front cover gives the impression of a single speaker, there are actually 4 drivers, each powered by a dedicated powerful and efficient class D amplifier which delivers the full rich sound. Combined with sophisticated signal processing, these deliver a remarkable spread of rich stereo sound that competes with (and betters) conventional stereo systems at similar and often higher prices. The Model M is not just an Bluetooth player. 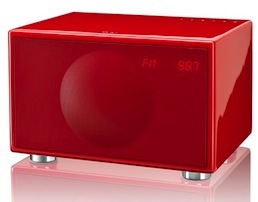 It also feature a quality FM radio section and has a line input to allow you to connect devices such as Apple Airport which enables streaming from your computer. The Model M also includes an alarm clock. The Model M is similar in dimension to the Tivoli Music System which you may also like to consider. The Geneva Model M is beautiful constructed – solid, superbly finished and gives away nothing in terms of features. With the choice of finishes, there is sure to be one that suits you perfectly. Cool as they look, it's the sound quality that sells Geneva. You can come in an hear Geneva systems for yourself, right now. We've been hugely impressed - Geneva present a very real challenge to conventional hifi systems. Whichever model or finish suits you best, we can help you make the right choice. And have plenty in stock. Don't forget that when you deal with us you'll also be helping the little Hectors Dolphin survive with our WWF sponsorship.